In this procedure, it is very important to avoid inhaling the lime dust while mixing the lime-water solution. It is also very important to follow the soaking instructions as written, and then to follow the multiple steps of rinsing, soaking in fresh cold water and draining three times as written. Excess lime absorbed by the pepper rings must be removed to make safe pickles for the canning process recommended. 1. Wash peppers well and slice into ¼" thick slices (a mandolin slicer works well). Discard stem end. 2. 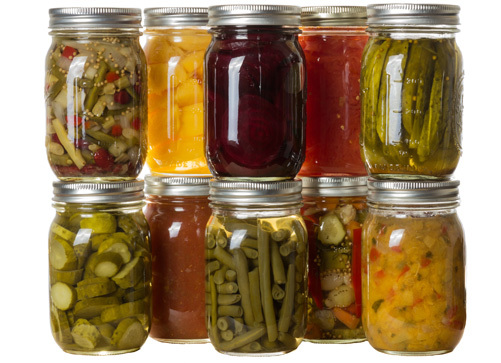 Mix 1½ cups pickling lime with 1½ gallons water in a stainless steel, glass or food grade plastic container. Avoid inhaling lime dust while mixing the lime-water solution. 3. Soak pepper slices in the lime water, in refrigerator, for 18 hours, stirring occasionally (12 to 24 hours may be used). 4. Drain lime solution from soaked pepper rings. Rinse peppers gently but thoroughly with water. 5. Cover pepper rings with fresh cold water and soak, in refrigerator, 1 hour. Drain water from peppers. 6. Repeat the rinsing, soaking and draining steps two more times. Drain thoroughly at the end. 8. Place 1 tablespoon mustard seed and 1½ teaspoons celery seed in the bottom of each clean, hot pint jar. 9. Pack drained pepper rings into the jars, leaving ½-inch headspace. 10. Bring cider vinegar, 1¾ cups water and canning salt to a boil over high heat. Ladle boiling hot brine solution over pepper rings in jars, leaving ½-inch headspace. Make sure pepper rings are covered with brine.